“Lighting the Way Home” – Contest and Countdown to Release Day! 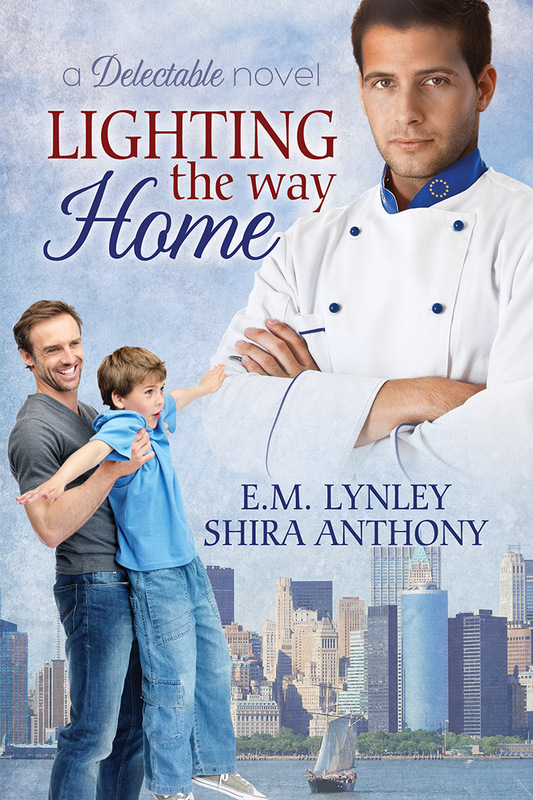 On Goodreads, add “Lighting the Way Home” to a new shelf called “Delectable” to be entered to win an e-book. Just add the book, and create a shelf by clicking… on the book icon and type the shelf name into the box and click “Add new shelf.” That way you can enter even if you’ve already added it to your to-read shelf. We’ll pick a winner on Thursday–release day is Friday, March 29. He already missed France. Even a week away from the restaurant now was something he couldn’t afford, not when they’d just been awarded their third Michelin star—the highest rating. Only about eighty restaurants in the whole world had achieved the feat. Press and gourmets from all over Europe were flocking there, and here he was, in New York, because his mother called and asked him to come home for the holidays. She’d told him she was scheduled for surgery, and she’d explain everything once he arrived. But not to worry, which from Miriam Golden was a signal to do exactly that. But Josh couldn’t help but worry. It was the main reason he’d agreed to come home—temporarily. The only reason. He’d kept his distance from New York—and the memories it held—for a reason. He hadn’t been back to his old neighborhood for five years, though he’d been in the States on a number of occasions he hadn’t mentioned to his family. They wouldn’t understand, he reminded himself at the wave of guilt that swept over him at the thought his mother’s condition was more serious than she’d admitted over the phone. She looked perfectly fine. She sounded like she had his entire life. As they walked toward baggage claim, Josh’s dad shuffled along; then his mother turned around and smiled enigmatically. Oh yeah. Now he was really worried, but it had nothing to do with his mother’s health. They were in the car driving toward Manhattan, stuck on the Long Island Expressway. They had barely made it a mile from JFK. His father’s shoulders were visibly tense—Josh knew how he hated dealing with the traffic. Why hadn’t he just taken a cab instead of letting them pick him up? He could afford it. Just his father’s name. That was all his mother had to say—in just the right tone, with heavy emphasis on the first syllable—and his dad shrugged and turned his attention back toward the road ahead of them. Amazing, really. He still couldn’t figure out how she did it. It had worked on him, too, when he was a kid. It’d probably still work now, he thought wryly. Josh repressed a sigh. He knew she was more proud of him than she let on; she just didn’t quite understand how important his career was to him. Neither of them had understood why he’d left home, left Goldens, their family-run restaurant, and headed off on an international culinary adventure through Asia and Europe, eventually ending in France where he’d washed dishes and peeled potatoes to pay his way through Le Cordon Bleu. It wasn’t all about food at the time, but he put his passion into his cooking rather than dwell on the real reason he’d left. He’d finally got up enough courage—chutzpah, his dad would call it—to walk into Raymond Vessy’s kitchen and ask for a job. He was right out of culinary school and with no experience working in any professional kitchen other than his parents’ and half a dozen little places around Asia and Europe, learning local cuisines and techniques. Raymond had just stared at him as if he’d lost his mind. “I do not hire children,” Vessy said with a dismissive wave of his hand. “Come back when you have lived a little.” Undaunted, and knowing no explanation of his travels and experience would suffice, Josh had offered to prepare him a meal, and surprisingly, Vessy had relented. Josh had done everything himself, working from early in the morning to have dinner prepared for the chef. The look of happy surprise on Vessy’s face had been worth every Band-Aid on his fingers. “Really? Why this combination? And five-spiced pineapple.” He pursed his lips in the way the French had that could be interest or insult. Josh had struggled to express himself in French. “Petite sirah.” Josh made sure to state it with confidence, even though he felt anything but. He could see by the raised eyebrows he’d impressed Raymond, who’d made an exception to his “no babies” rule and given him a job on the spot. He started as a kitchen assistant, tasked with the scut work in the kitchen—peeling, boning, and cleaning up after the more experienced staff—but once a week Raymond asked him to prepare staff lunch, and after six months he’d been promoted to the lowest rung of station chef. Five years later, Josh was number two in the restaurant and all but ran the place. The drive to his parents’ house, only twenty miles, took two hours in typical traffic. They’d hit rush hour. Jet lag and the late nights at the restaurant caught up with Josh, and he fell asleep curled up on the backseat of the car. By the time they’d parked the car in the garage and Josh’s mother shook him from his slumber, it was six o’clock. Josh sat up and moved to wipe the back of his hand across his face, but his mother’s glare put paid to that intention. He hoped he hadn’t drooled while he slept. He ran his fingers through his hair to smooth it down as his father shuffled around to the trunk. “Dad, I’ll bring the luggage.” Josh put his hand on his father’s shoulder and with a forced smile, placed himself between his father and the trunk. He was here to help them, wasn’t he? His dad didn’t need to be schlepping his bags. Josh tuned her out. He loved her, but it was times like these he realized how much he’d changed since he left home and begun his own life. His parents would never understand why he did what he did, why he’d chosen a different life from theirs. He’d given up explaining himself, but then they asked so many questions. He was caught in the middle. Somewhere between the kid and the adult. He stifled a yawn as he wheeled the suitcase in through the kitchen, letting it bounce over the raised threshold that separated inside from out. The kitchen looked the same, with its drab linoleum floors, ruffled curtains, and metal cabinets. The clock over the sink was the same one Josh remembered from when he was a kid—the electrical cord ran from the bottom up and over the pass-through to the dining room. “Why get a new clock?” his father had said when Josh had suggested a battery-operated one on a trip home from college. “This one works fine.” The kitchen smelled good, though. Comforting. Familiar. Thundering feet rushed down the stairs and a blue and red blur sped past him. Was that a kid? His gaze followed the blur toward the kitchen, and sure enough a boy of about ten was settling himself in at the kitchen table. His mother smiled at the boy and ruffled his hair, just like she had always done when Josh was that age. Whoever the boy was, Josh was too tired to have what promised to be a strange conversation with his mother about him. He turned back toward the stairs, came face to face and nearly collided with a man who had just stepped down. NOW AVAILABLE FOR PREORDER AT DREAMSPINNER PRESS!